Instrument Transformers Limited (ITL) is based in East Kilbride, Scotland and designs, manufactures low & medium voltage instrument transformers for electrical switchgear companies and electricity utilities around the world. The company found that when it embarked on its 'lean' journey several years ago and with help from Scottish Enterprise's Scottish Manufacturing Advisory Service, not only were its lead times halved, but the process also created 35% more floor space. This development has also lead to the company experiencing a growth spurt, which has seen turnover increase by 20-30% over the past couple of years. Established in 1973, ITL has a low staff turnover, seeing some of its 25 employees stay with the company for more than 3 decades. This has ensured that a comprehensive bank of expertise in transformer design and electrical engineering is preserved within the company - a rare commodity in these times of outsourcing by larger organisations. 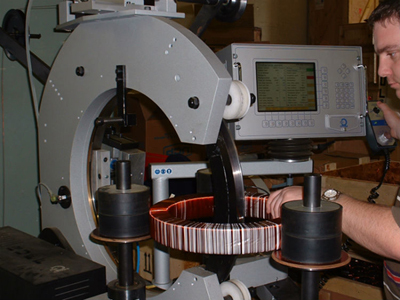 A reduction in the UK manufacturing electrical switchgear industry means many skill sets are being lost, "Our engineers are being called on more and more as they have gained extensive knowledge about customers' applications: this experience means that even with very limited information we can design and manufacture a current or voltage transformer solution for our customer," Paul said. ITL supplies markets around the world and its transformers can be found everywhere from Heathrow's T5 and London Tubes Jubilee extension to the world's tallest building, Burj Khalifa and Dubai Airport. It has also supplied transformers for the Royal Navy Type 45 Destroyers and will provide transformers for the forthcoming aircraft carriers HMS Queen Elizabeth & HMS Prince of Wales. "Walk into any shopping centre or supermarket store and there will be sure to be one of our products - it's just not visible," Paul said. As Asia continues to grow ITL sees low cost markets such as Vietnam & Cambodia providing greater business opportunities within the next three to four years. Africa like Asia will increase its’ development on infrastructure, ITL envisages that it will start to see a greater uptake of is sub-station products in the continent's development projects. "We exhibit in the Middle East regularly, which is also an important market for us," - Paul said. "It is very much about seeing what is happening in the marketplace and taking advantage of a reputation built up over 40 years - we want to utilise the fact that we have made a good name for ourselves." Lean management systems are not the only reason for the company's impressive performance. Paul said: "We have also been expanding our portfolio by introducing products that are not necessarily made by us, but we ensure are tested and they comply with international requirements. This allows us to offer our existing customers more of a one stop shop offering." Many of the major manufacturers that ITL deal with have relocated out of the UK, which means they are consolidating their supplier base and looking for suppliers who can sell them more. This has seen on-going organic growth in turnover of about 10% that ITL believes will continue. Paul said: "We believe in being part of our customer's processes and always challenging the status quo - but is also vital to champion your achievements to your customer - something SMAS has helped us realise. There is no point in continually working to make improvements if your customer does not know you can save them money!"